Barrick Gold (NYSE, TSX: ABX) said on Thursday that customs authorities in the Dominican Republic have halted a shipment of gold from the recently-opened Pueblo Viejo mine. Barrick said it has provided officials with additional information and is seeking confirmation that the shipment can resume, while further investigating the cause of the delay. Pueblo Viejo entered commercial production in January, but not long after the country's legislature said it would review and possibly change the contract with the Toronto-based company, in a bid to make the terms "more favourable". Pueblo Viejo, which is 60% owned by operator Barrick and 40% by fellow Canadian Goldcorp (TSX: G), (NYSE: GG), was built for $3.7 billion and holds 15 million ounces of reserves, making it one of the biggest gold mines in the world. 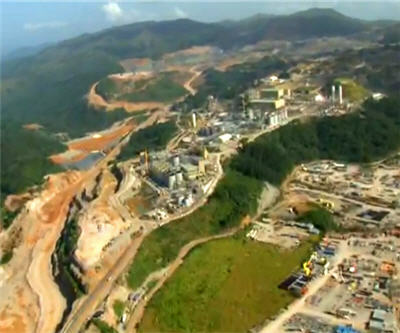 Aerial image of mine construction from YouTube published September 2011.